Vibralux, is the Glam love child of Lawrence, KS Bohemian Polymath artist Mercury Mad who is currently incorporating everything learned since his days of Music Theatere into nights of Rock n Roll debauchery and one full-bodied archaic Rock experience. Neither the theatrics or musicality of the Vibralux show should come as any surprise to those who know the history of their heady leader. As a young performer Mad, who played the Plant in “Little Shop of Horrors” in high school began studies in Graphic Design and Music Comp at KSU while playing guitar for productions such as “Hair” and “Bye Bye Birdie”. Time off was spent teaching guitar for KSU’s continuing education program and moonlighting in tenor roles such as Jack in Sondheim’s “Into the Woods” and Henrik in “A Little Night Music”. Love of performance and the stage would lead to a transfer to The University of Kansas and choose a final major in Theatre & Film. 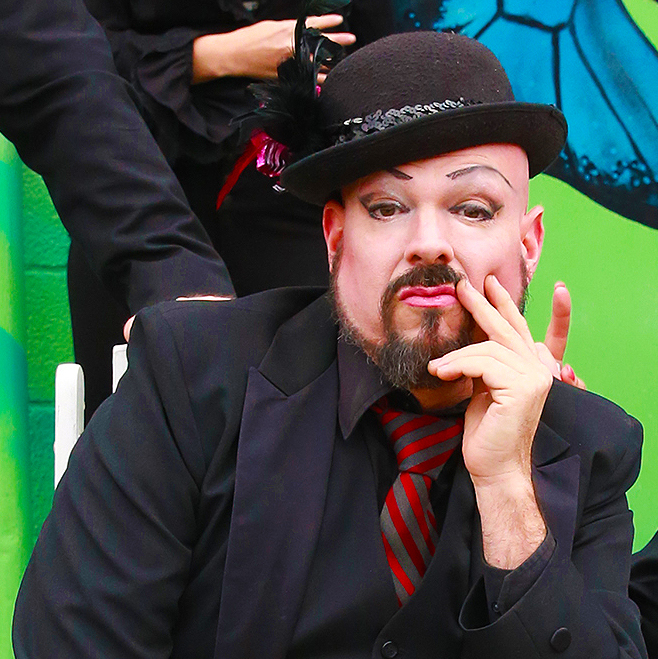 Theatre would be the melting pot for Mad juggling various art forms. It was here he/she caught their musical tour bug playing guitar for the KU production of “School House Rock Live”. Mercury continued to develop an artistic repertoire working as make-up artist for a University production of Vaclav Havel’s “Temptation”, a job that required precision and creativity in the delicate art that would come to mean so much to an on-stage persona. When creating Vibralux in 2001, all these art forms would be combined: the acting, the singing, the make-up and not to mention the various bands played in during teen years. Vibralux became the work of Art, the “Dolls”, with Mercury growing as the sarcastic Messianic figure audiences came to know and love. In 2003 Vibralux was featured on the cover of Rock Kansas.Com and stole KC Pitch Weekly’s award for Best Drag Show. In 2004 the group was nominated for The Pitch Best live Performance. In the spring of 2006. Merc accepted the Stonewall Society’s New York Fresh Fruits award for best live performance on behalf of Vibralux. In it’s 16 year duration of existence Vibralux opened for acts such as Black Pool Lights, Straylight run, Venus De Mars, The Genitorturers, Attrition, Shiny Toy Guns, HIM, and Electric Six. 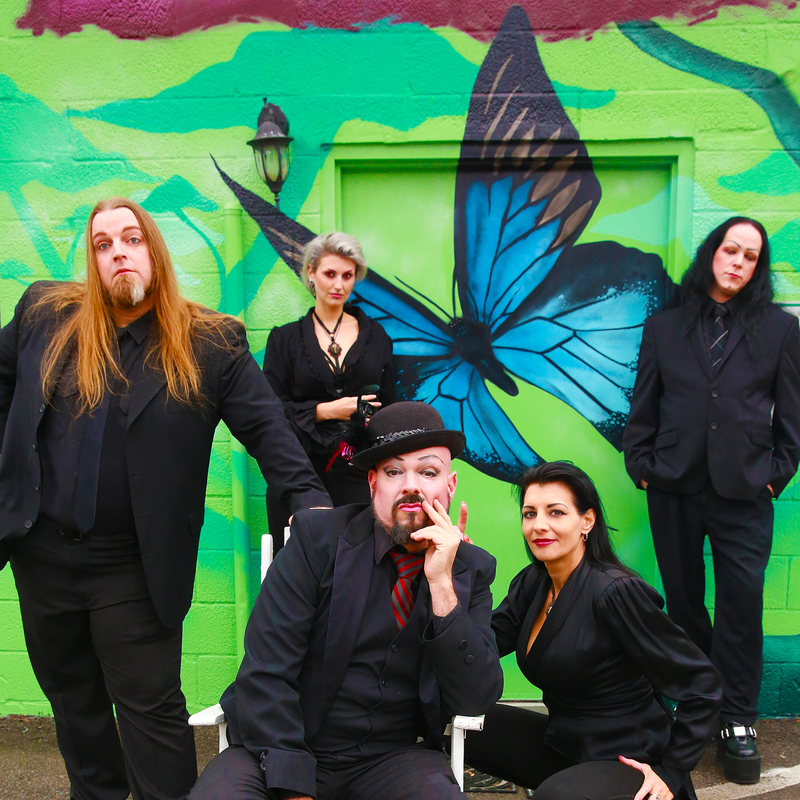 Albeit known for their provocative dress and outrageous stage antics Vibralux has been noted as one of Kansas City’s most professional bands to work with. While continuing with tours Mercury Mad backed Minneapolis group, APOX on Bass and Guitar for the U-35 DVD video tour. Merc worked later tours as philanthropist, booker/promoter, spokes person, and performing artist playing and singing solo acoustic shows as well as adding alt Glam/Grunge electrics and Ring Leader stage barking skills on the Apocalypse Theatre Revolution Circus Tour. It was during these tours Mercury collaborated with current Vibralux drummer Ken Pillar and backing singer Nichole Hobbes. Simone Beason was later added after her audition for the Vibralux stage production of “Dance of The Dolls” for Kansas City Fringe Festival 2016. The current Vibralux cast consisting of Mercury Mad, original bassist Asmo, Ken Pillar on Drums, with Simone, and Hobbes backing voices and chants is currently working on “Book of The Dolls”, a set of three EPs to be released by or before December of 2019.